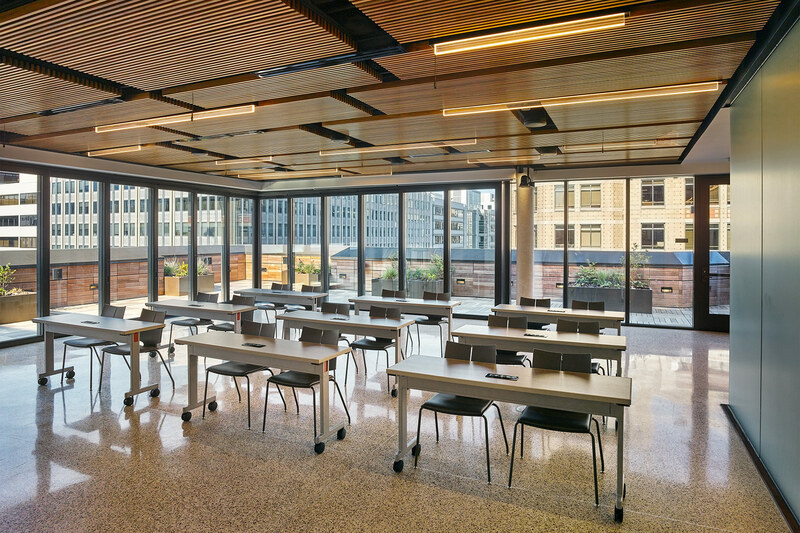 CORE architecture + design painstakingly preserved the building’s historic exterior while adding square footage to existing floors, and a roof-level addition and outdoor terrace. 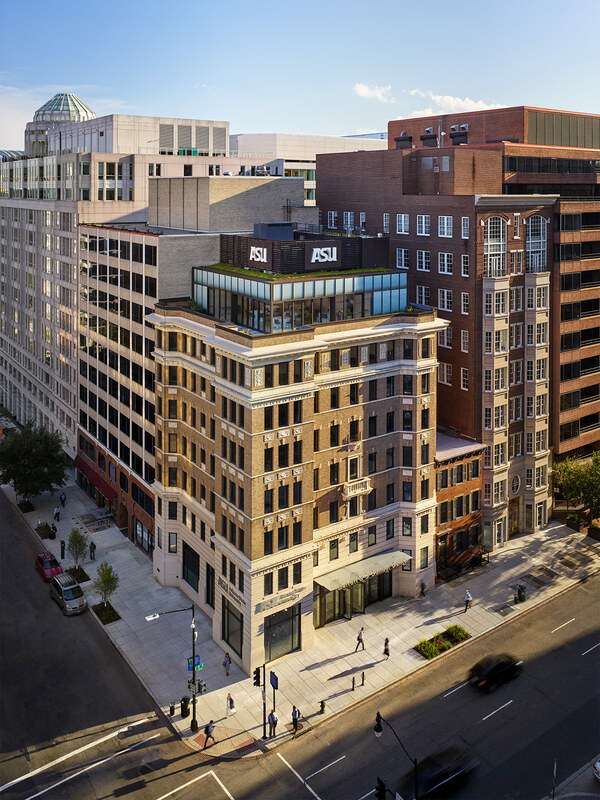 CORE architecture + design (CORE) completed Arizona State University’s (ASU) new DC headquarters at 1800 Eye Street, NW. As Design Architect, CORE renovated and expanded the historic structure that was purportedly the first concrete and masonry residential building in DC. 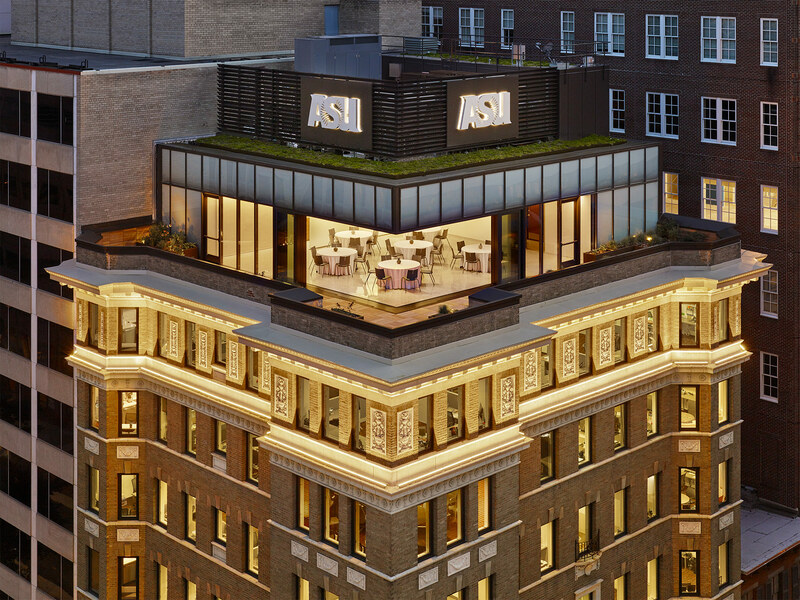 The 8-story, 32,000 SF building enables ASU to consolidate its DC office, teaching and event spaces. ASU officially opened the Barrett and O’Connor Washington Center (named after Ambassador Barbara Barrett and Justice Sandra Day O’Connor) with a series of celebratory events in mid-March. ASU has long hosted students, faculty and staff in Washington, DC. With the new building, the university has space to expand the offerings of the initiatives based there, including the McCain Institute for International Leadership, the Walter Cronkite School of Journalism and Mass Communication, Cronkite News/Arizona PBS Washington Bureau, the Academy for Innovative Higher Education Leadership, the Center on the Future of War, and the Global Security Initiative. 1800 Eye Street is adjacent to the World Bank and two blocks from the White House. Originally constructed as apartments around 1910, the building was converted into offices in the 1960s. CORE faced significant challenges as it maximized the building’s redevelopment. Large, bearing-masonry chimneys that could not be removed without major structural work took up valuable interior square footage, while a back courtyard further reduced the usable space on the small lot. The lower floors were at split-levels from the exterior sidewalk grade, impeding building accessibility. With approval by the Board of Zoning Adjustments to increase the FAR, the courtyard was in-filled for 100 percent lot use. To maintain the historic building exterior, CORE carefully braced the masonry façade from the inside (due to the site’s size) while the new building core and concrete structure were put in place. The expanded design added roughly 3,600 SF of new space by underpinning and excavating a new basement, allowing for necessary building utility and storage spaces. CORE reconstructed the ground floor so it was level with the sidewalk grade, and used the remaining FAR square footage as a new story on the roof. The increased FAR allowed CORE to design a glassy, modern addition designated for classroom, meeting and event space. Classrooms, office space, and conference rooms primarily occupy floors two through seven. The two gems of the renovation design are the 8th floor outdoor terrace and the state-of-the-art, multi-purpose lobby. The modern 8th floor addition is stepped back from the historic façade, creating an outdoor terrace wrapping two sides of the building. The setback was a requirement of DC Historic Preservation to distinguish the modern addition from the original building. 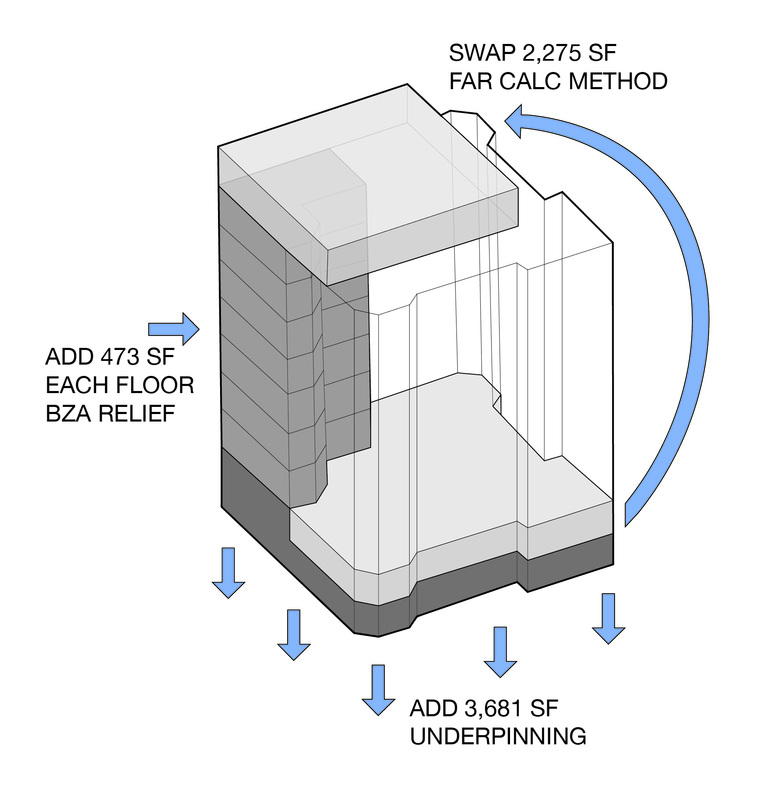 To visually and physically expand the smaller 8th floor interior footprint, a cantilevered, retractable corner glass wall was designed to optimize the corner views downtown and blur the indoor/outdoor distinction. The ASU “Decision Theater”—a round, high-tech conference room that ties directly to other similar rooms across the globe—required a high ceiling, extensive soundproofing, and cutting-edge media connectivity. Due to constraints of the existing floor levels, the ground floor is the only story tall enough to accommodate the program. CORE celebrated the room’s unique cylindrical shape, making the volume a design element distinctly visible in the lobby and from the street. 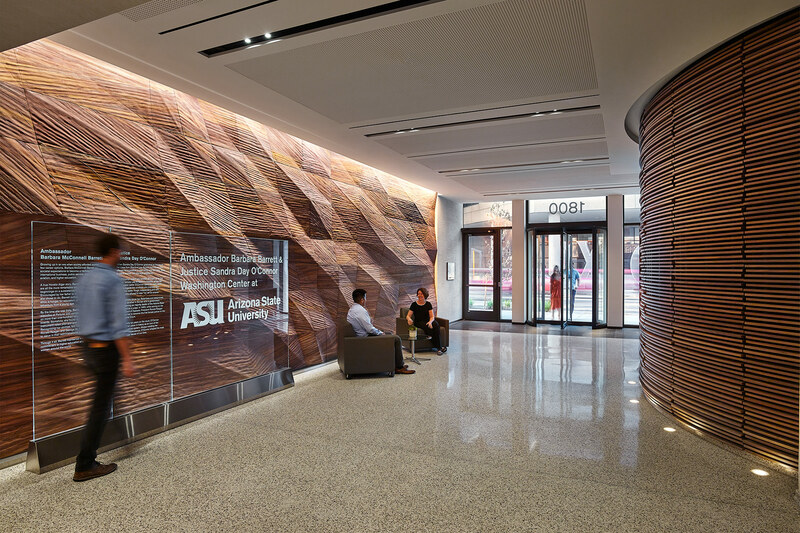 ASU also requested the use of sandstone in the lobby’s feature walls. CORE designed a CNC-fabricated, sculptural wall using very strong meta-quartzite sandstone quarried in the Southwest. “With the Barrett and O’Connor Washington Center, Arizona State University doesn’t just have a presence in Washington, DC. It is a presence,” said ASU’s president Michael M. Crow. University Realty, a subsidiary of ASU Enterprise Partners, bought 1800 Eye Street from EastBanc in December 2013. In addition to CORE (as project architect and architect of record), project team members included: DPR Construction (General Contractor), Girard Engineering, PC (MEP), Shemro Engineering, LLC (Structural Engineer), Schnabel Engineering (Geotechnical Engineer), Wiles Mensch Corporation (Civil Engineer), Odeh Engineers (Façade Consultant), Rosa D. Cheney AIA, PLLC (LEED, Specifications), and Monarch Construction (Owner’s Representative). Under the leadership of Principals Dale Stewart, Guy Martin, Allison Cooke, and David Cheney, CORE thrives on complex projects and leads with experience, understanding that their best work comes from designing hand in hand with their clients. Bringing a spirit of exploration to each project, CORE believes that design has the power to shape experiences. Visit coredc.com and follow COREdc on Twitter, Instagram, Facebook, and LinkedIn.